The building blocks of life are proteins and nucleic acids, both of which are extremely complex molecules. Given just the right arrangement of a large number of proteins and nucleic acids, you might have a cell capable of self-reproduction. But an organic molecule is simply a molecule containing carbon, one that may either be very simple or one that may be complex. The very term “organic molecule” is a poor one, because many of the so-called organic molecules have nothing to do with life. It is true that proteins and nucleic acids are organic molecules, but that doesn't mean you have found anything like a building block of life merely because you have found an organic molecule. The building blocks of an opera company are string musicians such as violinists, and singers such as tenors, sopranos and baritones that can sing Italian. All of these are organisms. But it would make no sense to say, “I have some building blocks of an opera company because I have two mice in my cage, and they are organisms.” It makes equally little sense to say that you have some building blocks of life merely because you have simple organic molecules. But if the organic molecules found on Mars are not the building blocks of life, are they at least the building blocks of the building blocks of life? No, they are no such thing. The building blocks of proteins are amino acids. The building blocks of nucleic acids are chemicals called purines and pyrimidines. None of these has been found on Mars. So not only have we not found the building blocks of life, we haven't even found on Mars the building blocks of the building blocks of life. A story of the announcement on the Popular Mechanics site told us that “Curiosity just found an abundance of organic compounds on Mars.” That's not correct, because the actual level of organic molecules was only “a few dozen parts per 100 million,” or about 2 parts in 10 million. By comparison, Earth soil is about 5 percent organic compounds. Science magazine engaged in equally misleading reporting, telling us that “In its quest to find molecules that could point to life on Mars, NASA's Curiosity rover has struck a gusher.” Finding about 2 parts in 10 million is hardly hitting a gusher. Science magazine also gave us the “building blocks of life” bunk, untrue for the reason I just explained. One scientist named Inge declared that Thursday's announcements were “breakthroughs in astrobiology,” which is nonsensical. You would only have a breakthrough in astrobiology if life were to be discovered. As for the scientific paper regarding methane, it's pretty much a yawner. Some scientists have found methane on Mars in an extremely low concentration, only about 1 part per billion. The scientists claim that there is a seasonal variation, but since it's only a tiny variation, the variation could easily be simply a random variation, or something due to variability in instrument readings. The scientists have only three years of data, which is not enough for one to have any confidence about season variation. The variation could easily just be random variation not actually caused by a seasonal effect. Similarly, if you plot ups and down of the stock market for a small number of years such as three, you will have maybe a 10% or 20% chance of picking up a “seasonal variation” which is a pure chance variation, not a real seasonal effect. 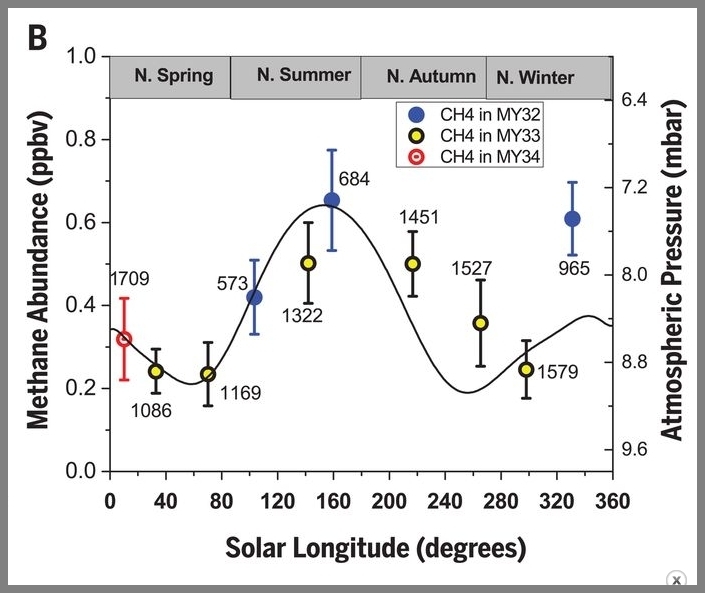 The authors of the methane paper claim to have picked up evidence of a “strong seasonal variation.” But the graphs of their paper don't seem to show that. Below is Figure 2 from the paper, which is the same one reproduced in the nbcnews.com story. We see readings from three years, and one of those years has only one reading. In red we see the one reading from Mars Year 34 (MY34). In blue we see some readings from Mars Year 33, and in yellow we see readings from Mars Year 32. No clear seasonal trend is shown. 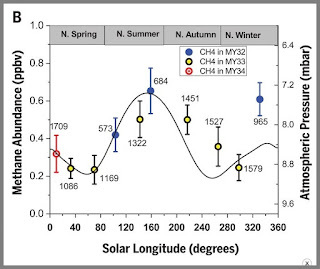 The Mars Year 32 readings tell you that methane is strongest in winter and summer. The Mars Year 33 readings tell you that the methane is strongest in summer and autumn. There is too little data to draw any conclusions about a seasonal effect, and any slim suggestion of a seasonal effect could easily be a random variation. You would need four or five years of readings before you could talk with any confidence about any seasonal effect. Methane on Mars could easily be caused by geological processes having nothing to do with life. 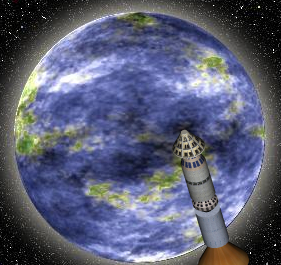 Has anyone found anywhere in the solar system outside of Earth the building blocks of life? No, because neither proteins nor nucleic acids have been found outside of Earth. But what about the building blocks of the building blocks of life – have they ever been found outside of Earth? There's only one such building block of a building block of life that has been found: glycine has been found in a comet. Glycine is one of the two simplest amino acids. None of the other more complicated amino acids has been found in space. So we've found in space none of the building blocks of life, and have merely found one of the building blocks of the building blocks of life, on a comet rather than Mars. Let us imagine a woman named Jane who has dated for five years a man named Walter. Jane wants to believe that Walter is a millionaire, but the problem is that she has seen no sign in the past five years that Walter has any money whatsoever. Imagine that one day Jane sticks her arms down between the cracks in Walter's sofa, and finds some pennies; and she then says, “I'm ecstatic – this is money, so he might be a millionaire.” This week our science journalists were like Jane, acting all excited because after years of study Mars has finally coughed up faint traces of biologically irrelevant carbon compounds that are neither building blocks of life nor the building blocks of the building blocks of life. Postscript: We have further evidence of Mars bunk in this article published on the web site of Air and Space Magazine. It has the phony-baloney title "Fingerprints of Martian Life." Written by professor Dirk Schulze-Makuch, the article claims that "large and complex organic molecules" were discovered. No such molecules were found. The scientific paper mentions triophenes, which have a mere 9 atoms, and aliphatic compounds, which have a mere 12 or 14 atoms. The average protein molecule in a human has more than 1000 atoms. The article tells us that "proteins or nucleic acids (such as DNA) are the building blocks of life," and gives some devious wording designed to make you wonder whether such things were found on Mars. They certainly were not. Equally misleading is this headline from the Independent, saying "Best evidence yet for alien life on Saturn's moon found by scientists." It refers to the mere detection of organic molecules that have a molecular weight of no greater than about 200, which indicates molecules with about 20 atoms. But an average protein has a molecular weight of more than 10,000, and you need hundreds of such proteins (each different and fine-tuned) to make a living cell. In December 2018 a probe to Mars specifically designed to find the faintest traces of methane found no methane at all.